A new birdspecies for TN. The Black-backed Puffback (Dryoscopus cubla) is a species of passerine bird in the Malaconotidae family. 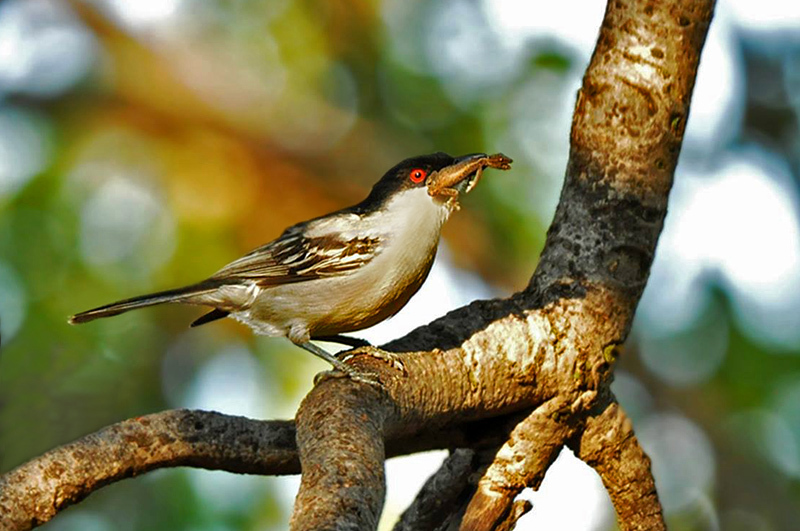 They are common to fairly common sedentary bushshrikes in various wooded habitats in Africa south of the equator. They restlessly move about singly, in pairs or family groups, and generally frequent tree canopies. Like others of its genus, the males puff out the loose rump and lower back feathers in display, to assume a remarkable ball-like appearance. They draw attention to themselves by their varied repertoire of whistling, clicking and rasping sounds. They measure about 17 cm in length, and the sexes are similar though easily distinguishable. Adult males have the upperparts deep blue-black with a slight luster. The black cap subtends the red eye, the upperpart plumage is black-and-white, and the underparts pure white. Females have a black loral stripe and white supraloral feathering, with the ear coverts pale and the crown not solidly black. They also have greyer backs than males, and grey to buffy tones to the white plumage tracts. They usually occur in pairs and actively move about the higher strata of trees, sometimes in mixed-species flocks. Their food consists of large numbers of caterpillars, besides beetles, ants, termites and small fruit. It is monogamous and single-brooded like other studied species of Dryoscopus. The nest is completed by the female in about 11 days, at which time she is accompanied by the male which regularly calls and displays. The female incubates for 13 to 14 days after she completed laying the clutch of two to three eggs at day intervals. Both parents rear the chicks, which leave the nest after some 18 days. There are five accepted races. Description: Both sexes lack white edging to remiges and wing coverts. White scapular bar distinct in male, but indistinctly grey in female. Female has black loral spot. Description: Marginally smaller than nominate, and similar to hamatus, but female has black loral spot. Description: Pure white lower back, rump and underpart plumage in male, greyer in female. Broader white edging to remiges than nominate, and prominent white scapular bar. Irides red. Description: Off-white underpart plumage. Central lower back and rump washed grey. Broader white edging to remiges than nominate. Female has prominent supercillium. Irides red. Description: Distinctly greyish lower back, rump and underpart plumage, contrasting with white belly. Narrow white edging to remiges and wing coverts, and limited white scapular bar. Irides orange. Source: Parts of the Wikipedia information. Beautiful bird;Black-Backed Puffback. Like the story of your picture. But chest color (blackish) doesn't look perfect. I think to remove harsh sunlight on its white feathers, you have tried hard. But to me it doesn't look well, rather overexposed white feathers looks better. I have posted this bird before in 2014. A very interesting bird with a strong beak. Difficult to find this rare specie.